Tensions began Friday night, as several hundred white supremacists chanted "White lives matter!" and "Jews will not replace us!" as they carried torches in a parade through the University of Virginia campus. CHARLOTTESVILLE, Va. – Hours before a noon rally was set to begin Saturday, violent skirmishes broke out between bands of white supremacists and counterprotesters who have converged on this college town around the issue of a Confederate statue. Men in combat gear, some waring bicycle and motorcycle helmets and carrying clubs and sticks and makeshift shields fought each other in the downtown streets, with little apparent police interference. Both sides sprayed each other with chemical irritants and plastic bottles were hurled through the air. State police and Charlottesville police in riot gear were stationed on side streets but were not in the most concentrated areas where protesters and counterprotesters were brawling. Gov. Terry McAuliffe had placed the National Guard on standby but they, too, were not in the downtown area where the morning clashes were occurring. 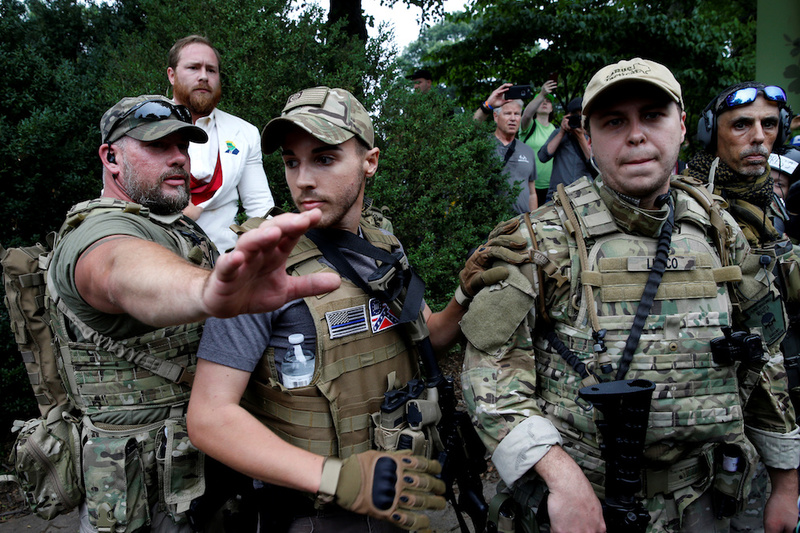 By 11 a.m., several fully armed militias and hundreds of right wing rally goers had poured into the small downtown park that is the site of the planned rally. Charlottesville officials, concerned about crowds and safety issues, had tried to move the rally to a larger park away from the city’s downtown. But Jason Kessler, the rally’s organizer, filed a successful lawsuit against the city that was supported by the Virginia ACLU, saying that his First Amendment rights would be violated by moving the rally. 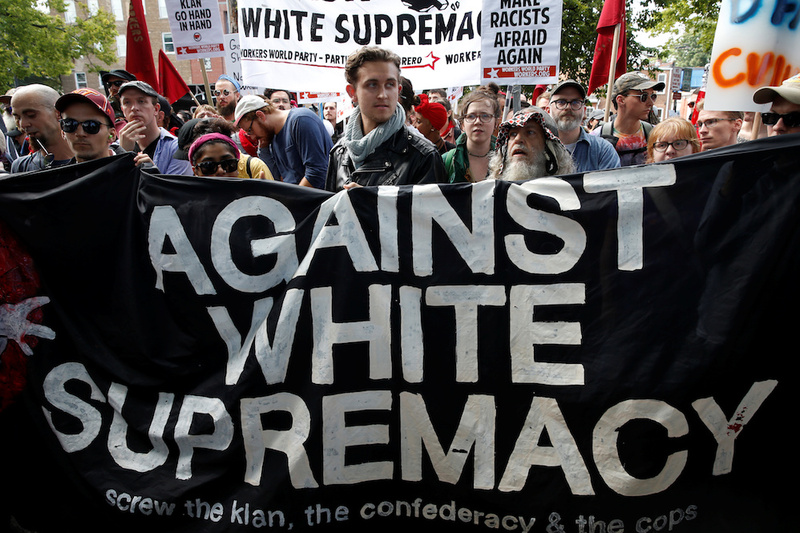 Tensions began Friday night, as several hundred white supremacists chanted “White lives matter!” “You will not replace us!” and “Jews will not replace us!” as they carried torches in a parade through the University of Virginia campus. The fast-paced march was made up almost exclusively of men in their 20s and 30s, though there were some who looked to be in their mid-teens. Meanwhile, hundreds of counterprotesters packed a church to pray and organize. A small group of counterprotesters clashed with the marchers shortly before 10 p.m. at the base of a statue of Thomas Jefferson, the university’s founder. One counterprotester apparently deployed a chemical spray, which affected the eyes of a dozen or so marchers. It left them floundering and seeking medical assistance. Police officers who had been keeping a wary eye on the march jumped in and broke up the fights. The marchers then disbanded, though several remained and were treated by police and medical personnel for the effects of the mace attack. It was not clear if any one was arrested. The march came on the eve of the Unite the Right rally, a gathering of groups from around the country whose members have said they are being persecuted for being white and that white history in America is being erased. The Saturday rally is scheduled for Saturday at noon at Emancipation Park, formerly Lee Park, home to a statue of Confederate General Robert E. Lee that the city of Charlottesville voted to remove earlier this year. The statue remains in the park pending a judge’s ruling expected later this month. Many city leaders and residents have expressed concern about the prospect of violence at Saturday’s event. Saturday’s rally marks the second time in six weeks that Charlottesville has faced a protest from white supremacist groups for its decision to remove the statue. On July 8, about three dozen members of a regional Ku Klux Klan group protested in the city. The torchlight parade drew sharp condemnations from Charlottesville Mayor Mike Signer and U-Va. President Teresa Sullivan. Sullivan described herself as “deeply saddened and disturbed by the hateful behavior”shown by the marchers.